Louise Birmingham, age 94, formerly of Killbuck, NY and Salamanca, NY and recently of Eden Heights in Olean, NY passed away on Saturday morning, August 18, 2012 at The Pines Rehabilitation Center, Olean, New York following a short illness..
Mrs. Birmingham was married to James L. Birmingham for over sixty years. He predeceased her on August 7, 2001. She was the youngest of 13 siblings, all of whom predeceased her. Louise led a life of service to her community. 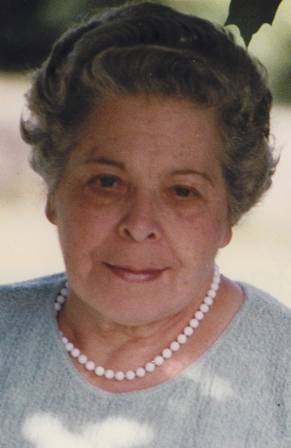 She was a founding member of the Killbuck Volunteer Fire Department Ladies' Auxiliary, The Ladies' Home Bureau and served on the Great Valley Town Board of Elections as an inspector. Louise held long-term various positions as officer in many organizations, including the Senior Citizens of Great Valley Chapter. Louise graduated from the St. Francis School of Nursing in Olean, New York. She was awarded the Excellence in Nursing honor upon her graduation. She was employed at the former St. Francis Hospital and former Salamanca Hospital and earned accolades from her patients and co-workers. She was known for her kindness, gentleness and compassion. Louise had significant inspirational impact on her daughters and grandchildren, who loved and admired her. Surviving are: 2 daughters, Marian Birmingham, Dayton, Nevada, Patricia Ryan, Churchville, New York; 8 grandchildren; 12 great grandchildren; 1 great-great grandson; a sister-in-law, Molly Birmingham, North Chatam, New York; several nieces and nephews, including, Mary Ann Powers, Olean, New York, Linda Rychcik, Salamanca, New York, Sharon Smith, Killbuck, New York, Margaret Weinholtz, Middleport, New York, Jennifer Quattrone, Randolph, New York, who without their love and loving care, Louise would not have attained her many years of longevity. Friends may call at the O'Rourke & O'Rourke Inc. Funeral Home, 25 River Street, Salamanca, New York on Tuesday from 7-9 P.M.
A prayer service will be held in the funeral home on Wednesday morning at 11:30 A.M. followed by a Mass of Christian Burial at 12 P.M. in Our Lady of Peace Parish with Rev. Ronald Mierzwa, of Holy Name of Mary Church, as celebrant assisted by Deacon Michael Anderson. Expressions of condolences may be directed to Hospice Care in your own communities. Volunteering at similar agencies would be the highest tribute you could choose to honor Mrs. Birmingham.